Every home is unique, which is why I offer a bespoke interior design service, tailored to you and your home. I undertake all project sizes so whether you require inspirational mood boards to start you on your design journey, spacial plans or complete project management, there is a service to suit you and your budget. The initial consultation is free of charge and presents an opportunity to establish a client brief, what you want and need in terms of both design and service and for you to discover how my services can help you. Inspiration through images, colour and textures. 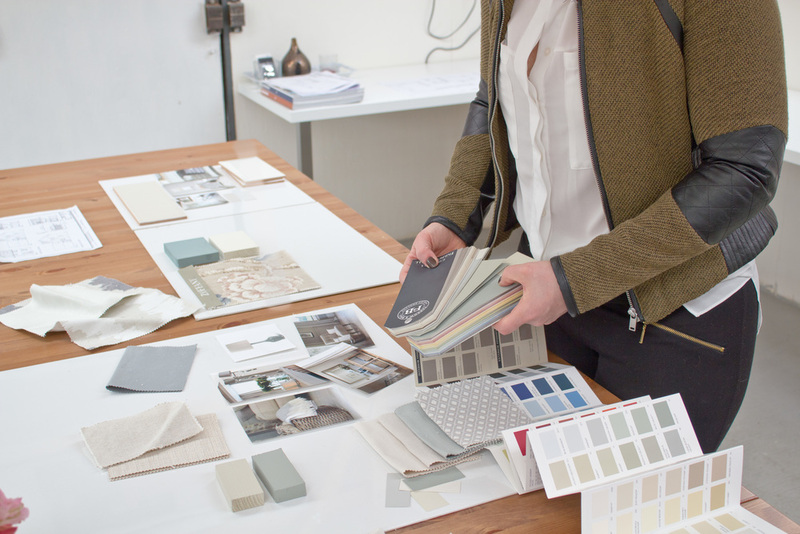 A mood board is the first step to a successful project and serves as the centre piece of the design process. Once presented, it will help you visualise how your space will look and feel and will be used as a reference to complete the project. A glance into the Interior Designers little black book. Utilising an Interior Designers product knowledge can save you hours of searching for the perfect furniture and finishes. A sample board detailing finishes will be presented along with a complete product specification. Furniture plans help to create a practical space for everyday living, ensuring everything you want is incorporated into the room and saving costly mistakes. Whilst lighting plans are developed to not only enhance a room but provide the different levels of lighting required for a functional space. An all encompassing package, overseeing the entire project from the initial concept stage through to completion and managing each aspect in between, such as spacial plans, product sourcing and finishing. All project sizes are undertaken, whether you are re-designing an existing space or building and extending your home. Following an initial consultation I will plan a day of visits to suppliers and retailers that will help you to discover your style and take inspiration to incorporate into your home. Inspiration days are available as half day or full day packages. Whether your home has been on the market for some time or you are at the very beginning of the process and wish to capitalise on initial interest, a home staging service can help to sell your house quickly and at full market value. Home staging uses your existing furniture and re-arranging, removing, or re-styling to appeal to a wider audience and assist in the sale of your home. We will be with you every step of the way, before finally photographing your home for sale.